Play alongside friends in the next-generation of Assassin's Creed. Assassin's Creed Unity will feature 4-player co-op. Unity's new feature was revealed at Microsoft's yearly E3 Xbox press conference, where it was shown off live on stage. 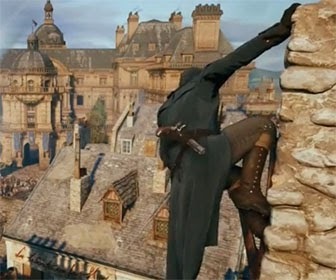 Multiple assassins are shown playing cooperatively, storming a royal castle on the eve of the bloody French Revolution. The action looks quintessential Assassin's Creed; silently moving through thick crowds, acting inconspicuously, and then suddenly, you strike. Only two assassins are shown at first, as they make their way through the crowd gathered outside of the palace, only to set things off by suddenly (and simultaneously) stabbing two guards. With the die cast, the two men begin scaling a nearby wall and enter the palace itself, where things get even bloodier. Inside the palace, soldiers and officers seem to know that something is up outside, but as for everyone else? Not so much. Our two original assassins run into two other player assassins and work together to bring the pain not only to the grunts guarding the castle, but the nobles that live in it, too. As you'd expect, things end with a beheading. This is the French Revolution, after all. While led by Ubisoft Montreal, nine other studios are working on Assassin’s Creed Unity, the first game in the series built specifically for PlayStation 4, Xbox One, and PC. The newest game in the open-world franchise takes place during the French Revolution.